Greetings to the Friends of Carmel, Children of Our Lady of the Rosary! October celebrates and honors in a special way Our Blessed Mother under this title—and the prayer and sacramental we call the rosary. Anyone who thinks this to be an outmoded, outdated devotion should visit our Carmel and open our emails everyday, try to keep up with our rosary orders and repairs—and more significantly, appreciate just how many thousands of families and individuals keep a daily tryst with Heaven through the Holy Rosary. It has been one of the greatest joys of our website apostolate to learn just how much Our Lady is loved through both her rosary and her scapular. And we take heart in knowing that the rosary unites so many souls with their heavenly Mother in prayer for this sad and troubled world! O God, Whose only begotten Son, by His Life, Death and Resurrection, has purchased for us the rewards of eternal life, grant, we beseech Thee, that while meditating on these mysteries of the most Holy Rosary of the Blessed Virgin Mary, we may imitate what they contain and obtain what they promise. Through the same Christ Our Lord. Amen. And of the words of this prayer, Father focused upon these: “imitate what they contain”. Praying the rosary and reflecting on the life of Our Savior, he said, should result not merely in admiration, but in imitation of Christ and all He has done. As Christians, we must follow in His footsteps, each one of us in our own way, in the providential events of our own lives. As Christ knew joys and sorrows, so must we. And as these led to His glory, so will ours lead to final happiness and glory. But when these joys and sorrows come into our lives, do we remember Our Divine Master at all? Do we sanctify our joys with remembrance of God and gratitude to Him? When we meet moments of difficulty and failure, days of worry and anxiety, do we stop a moment to realize that Our Savior encountered disappointments and sorrows like ours? “Surely, He hath borne our griefs and carried our sorrows…” (Isaias 53). Do we make a swift act of faith that these difficult circumstances, or difficult people, or whatever is troubling us, are sent by God for our good? The praying of the Holy Rosary is meant so to keep us united to the life of Our Lord—and His Blessed Mother—that we never forget we belong to Him and that He is ever with us: “I am with you all days…” Its faithful recitation is itself a striving to perfect our lives and to imitate Christ and His Mother. How much more we could tell you about this beautiful talk and about the Holy Rosary, but time and space do not allow us! However, we can tell you that we have finally been able to satisfy the interest and request of many people who have asked us how we make our rosaries. People are sometimes surprised at what we mean when we say that our rosaries are handmade. This little addition to our web site should clarify any confusion—and also intrigue those who wonder about this aspect of our Carmelite daily life. The long-awaited 2010 edition of the Seraphim Liturgical Calendar is now available. This year’s calendar again offers superb devotional art for each month, as well as Seraphim’s much-admired reference section featuring Catholic prayers, doctrines, patron saints, etc. With All Souls Day approaching, please take note that we are again inviting you to have your deceased loved ones remembered at our daily Masses during the month of November. 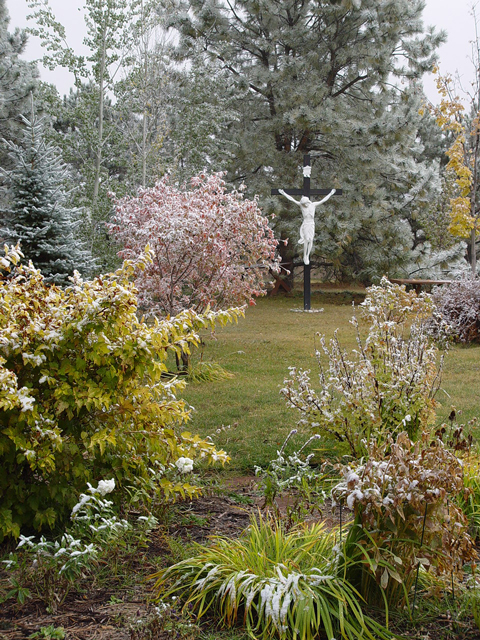 As many as five Masses each day are offered here at our chapel, and you are welcome to visit the page we have provided on our website for this special benefit. 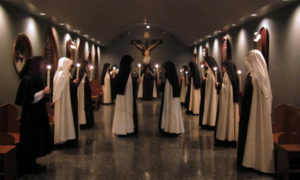 As you know, the Carmelite life is dedicated to prayer and sacrifice for the Church, especially for priests. We have received this “prime directive” from our holy Mother St. Teresa herself, who at the time of her reform of the Carmelite Order, made it the hallmark of the religious life she promoted in her monasteries. Appreciating deeply the great work of priests for souls, their special union with Christ, and the immense dangers of the world and of hell that encroach upon these emissaries of God to hamper and even destroy their influence for good, St. Teresa desired to help. Her heart of compassion longed to further this providential design—if not through direct participation in priestly work, instead by the great weapons of holiness, prayer, and sacrifice. It is our joy to follow, as best we can, our holy Mother’s command. How many priests we hear from and are privileged to assist in all sorts of ways! 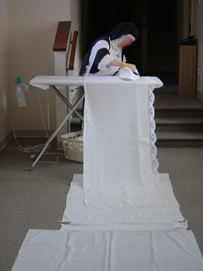 It may be preparing altar vestments or pressing altar linens. It may be corresponding with priests on behalf of souls under their care or sharing their worries. It is sometimes praying for the holy and happy death of elderly or sick priests*, or perhaps just repairing an old, but treasured, rosary one may have received in seminary days. All this and more God may send to us as ways of helping those in the priesthood. 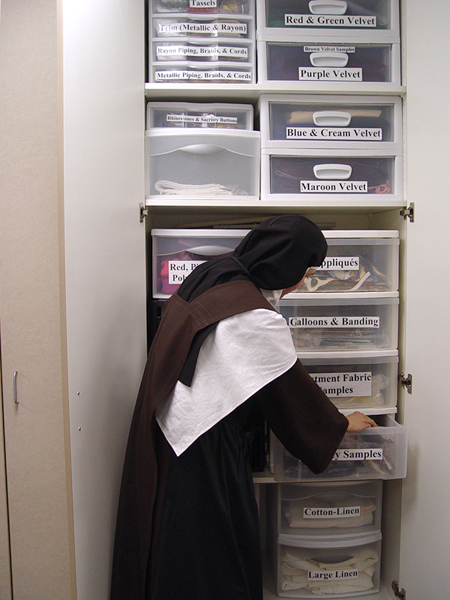 But we pray and firmly believe that each of these works, as well as all the simplest, smallest and most hidden duties of the day-in-and-day-out of our Carmelite life, are received in Heaven to the benefit of God’s priests, as well as seminarians, all over the world. We urge you to pray with us that God send His Church holy priests to serve Him and to labor for the salvation of souls. Other news from Carmel includes the familiar sewing projects: we recently finished an altar antependium to match the blue and gold vestment set for feasts of Our Lady. 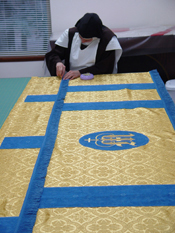 Work progresses on the St. Catherine Martyr vestment mentioned in our last letter. Other pressing projects demanded our setting it aside for a time, but we are working earnestly to complete it in the next few weeks, so it can be used on her upcoming feast day, November 25th. We spent a number of weeks, as time permitted, in “fall cleaning”—discarding or giving away unnecessary items and reorganizing our storage cupboards and closets. Our Mother Prioress is a master of this type of work! But we give hefty credit to a priest we know who is the devoted sacristan for his religious community. His ingenuity in filling efficiently and neatly every inch of space in his sacristy is the admiration of all who visit there. He has generously shared some of his secrets with us, one of which is the use of the clever plastic storage containers now available—sets of drawers in all sizes, cabinets on wheels, trays—you name it! All in faithful service to the Master in keeping the holy things of the altar clean and safe in a dignified way—what an example this one priest is to us! This week we celebrate the Feast of our renowned Mother of Carmel, St. Teresa of Jesus, so please join us in thanking God for such a great saint and friend! Her feast day always means the true end of summer here—and we often decorate for her day with branches of colorful leaves and whatever may remain of hardy fall flowers. It is a frosty day today, as we write this letter to the Friends of Carmel. The strange loveliness of frost on leaves of red and gold is striking enough. But to add to the color, a flash of blue wings occasionally passes by the windows and among the ponderosa branches: western and mountain bluebirds taking refuge within our enclosure on this chilly day, and foraging for seeds among the dying plants. We hope to send another newsletter soon, sharing some new book titles, new Christmas cards and other new gift ideas from Carmel. But we hasten to complete this letter and send it before too many days of October have passed. Today, October 13th, is the 92nd anniversary of the great Miracle of the Sun at Fatima. This momentous event in history reminds us of the constant message of Our Lady of Fatima in all her visits at the little holm oak so many years ago—to pray the rosary every day and to be faithful to the will of God in our daily duty. Know of our prayers for you. May Our Blessed Mother draw you to her Son through her Immaculate Heart! *This edition of the Sisters of Carmel Newsletter is dedicated to the memory of Rev. D. Carl Heinemeyer.